The Guilford County beekeepers picked up 54 packages of Italian bees from Brushy Mountain to be installed in hives throughout the area. 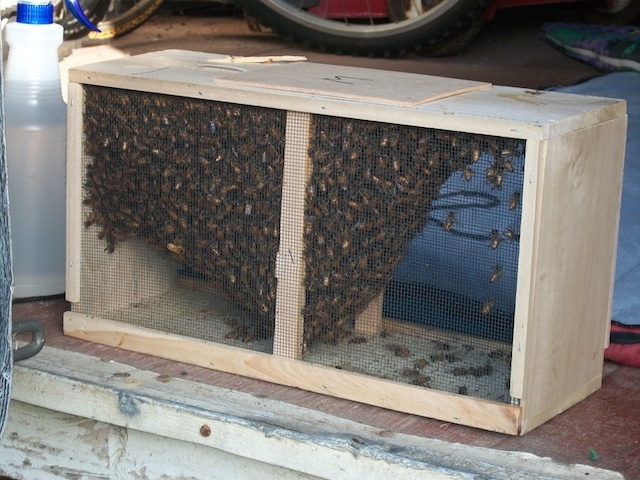 Bees are sold in about 3 pound packages and include a queen. This comes to well over a half million bees. We received a fine and lively group of bees. In the center of the cluster is a can of sweet syrup. 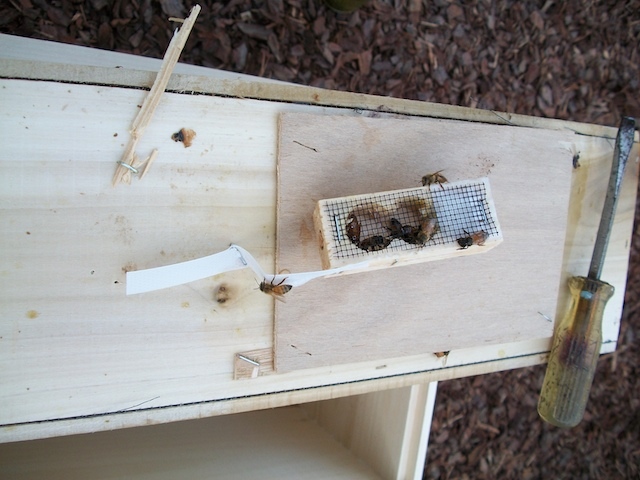 As well, suspended from the top is a smaller box with a new queen. The new queen comes in a three inch box with three sections and cork plugs on either side. She is sealed in this box with a couple of attendants. One third of the box is filled with a waxy substance called ‘queen candy.’ Once the cork is popped, a nail is carefully pushed through the candy to make it easier to chew through. The attendants will eat from one end, the worker bees munch through the other. By the time they meet the workers should be ready to accept the new queen. This year’s queens are marked with a blue dot in order to make them easier to find. Sam took a good look at her and was pleased that she was lively. He will go back tomorrow afternoon to see if the queen has been released. Sam and I had prepared the frames with pre-stamped foundations in the morning. He installed half the frames to start. This makes room to install the package. The worker bees will start working right away drawing out the combs. Picture this. Sam and I wearing bee veils and gloves. He’s got a book in one hand and a hive tool in the other. I’m trying to shake bees out of the box and take pictures. Maybe I am just naturally sweet because the bees kept landing on me but swirled around him. Two managed to crawl up my pants. Neither of us were stung. I’m afraid I had to ditch the camera. Sam and I both needed two hands. We shook the bees into the hive. 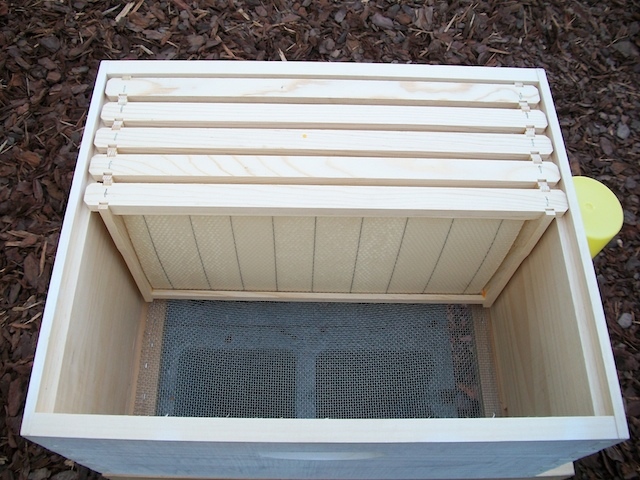 We are using an external hive feeder with equal parts sugar and water. At first we were going to block the entrance but decided to let the bees orient themselves to their new setting. 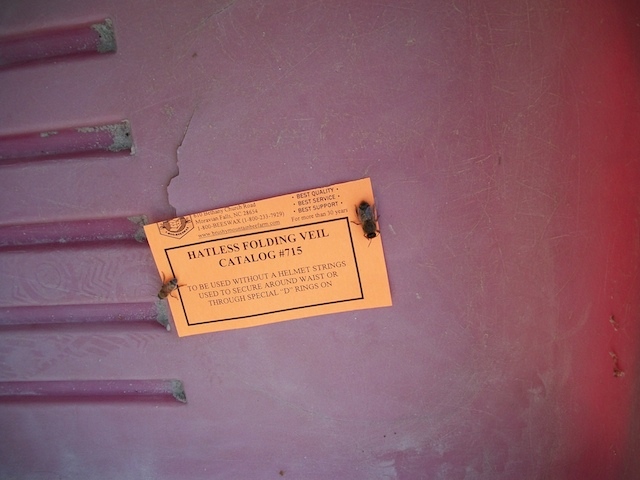 The head of the beekeepers suggested that they could start flying around right away. We put away our tools in an outbuilding we had cleaned out for Sam to use for his new hobby. Stray bees followed us (two up my pant leg). Once we unveiled we spotted two curious stragglers. One was quite large. I snapped this picture on a tag for perspective. That’s about a 14 point font in the title. The smaller bee is typically sized. Sam and were not sure about the big one. Is it one of ours or perhaps a different species? We will be looking into it. The B-man has spoken. The large bee is a drone.